Enewsletters and E-zines are valuable tools for networking with clients, prospects, and peers. Next-Step-Up Communications is savvy at affordable communication. The power of the internet allows for extensive communication and networking on many levels. E-zines and E-newsletters are more economical than traditional mailing pieces and are also more effective than many direct mail pieces. Custom design your masthead and each monthly piece. You aren't restricted to predictable templates and can have a creative approach to each issue. Creative Content - you supply or we do. Distribution List - Maintenance and development available. Expert Consultation - to help you launch your e-newsletter effectively. 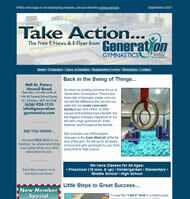 Click Here To read "The Successful Climb" Newsletter by Next-Step-Up Communications. A specific goal is a goal that incorporates an action plan that outlines how you will achieve the goal, and a performance measure that tells you how you will evaluate the goal. Contact us to reach your marketing and website goals! Client Survey - Have you had a project recently completed by Next-Step-Up? Let us know what you think by filling out this quick, online survey. Thanks so much!